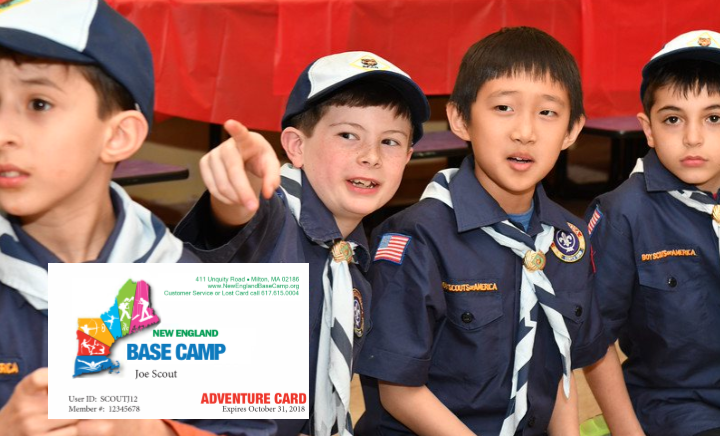 By now – most Cub Scout packs, dens and families have started using their Adventure Cards for several purposes. Entrance to either Base Camp (Lone Tree or Milton), discounts for Winter Camp, STEM camp, Day Camp, cabin rentals or other programs and services offered through the council. Additionally, most of our Venturers and Boy Scouts are also starting to increase the usage of card through high adventure programs, training programs and summer camp. Also, we are seeing a dramatic increase in Scoutbook usage which stitches all the programs together creating an individualized learning experience for each Scout. But that’s all old news – Now your Adventure Card is gaining a new set of benefits! Be sure to check out the website and Facebook for updates and discounts for family attractions all around Boston! Below read about the first few benefits that are included in with your Adventure Card. Boston Duck Tours is a great way to start off a visit to Boston. You get a great overview of the city through many unique neighborhoods as you splash into the Charles River for a breathtaking view of the Boston and Cambridge skylines. 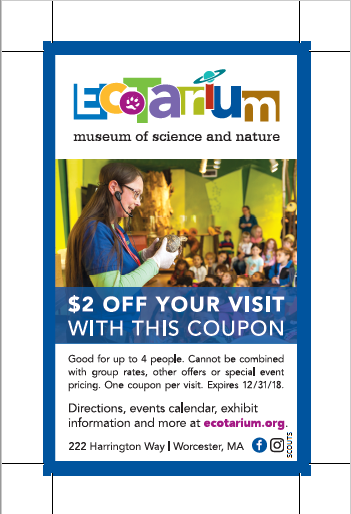 A Scout group will receive a special group rate for 10 or more guests (normally 20 or more guests) when you present the New England Adventure Card at their Museum of Science location. Scouts will also receive $2 off Kids tickets and $4 off Adult tickets for groups of less than 10 at the Museum of Science location with the Adventure Card! Historic New England Properties such as Historic New England Phillips House and Spencer-Peirce-Little Farm offer 2-for-1 admission (a 50% discount) to all Scouts and their families/chaperones with the Adventure Card! This is for general admission museum tours and does not include programs, events or private group tours. Please show your card at the Museum of Science ticket booth and mention the code C-Scouts. Ride the Red Trolley – Salem Trolley – Salem’s Original Trolley! Scouts get a 20% Discount on a group private one hour narrated historical tour of Salem with their Adventure Card. Trolleys hold 30-38 passengers. Contact salemtrolley@gmail.com or 978-744-5469. SCOUTbox is a monthly subscription box service built specifically for scouts, by scouts. Keep your scouts excited each month when they receive a box filled with awesome gear for camping and other outdoor adventures as well as educational materials to enhance scouting programs. For those in the Spirit Adventure Council, if you use the code SPIRIT888 you’ll get $8.88 off your first box when purchasing a subscription. It can be used on any of the 3 lengths; monthly, 3-month, or 6-month. Check out SCOUTbox online. With the Adventure Card, Plimoth Plantation has 15% admission discount for Scouting families, Packs and Troops that may be less than the traditional group minimum of 15 people with the opportunity to visit Plimoth Plantation, Plimoth Grist Mill and Mayflower II (scheduled to return early summer – 2019) on the day of their choice. A tremendous value for Boy Scouts (13 – 17 years) that reflects a 50% discount. 2018 Season Schedule: March 17th through November 25th, 9 AM until 5 PM daily. There will be an exciting STEM patch program for the Plimoth Grist Mill that will be a complimentary question/scavenger activity sheet for use at the mill, with patches available for sale through the retail store. Salem’s most visited museum is the perfect starting point for your visit to the historic city. Explore the story of the Salem Witch trials with your group (ten or more visitors receive group discounts). Through the Adventure Card, museum-goers will receive $1.00 off adult and $.50 off of child tickets for up to a family of six when presenting their card. This offer excludes weekends in October or Halloween Day. See their website for more information. Attitash Mountain Resort & Wildcat Mountain invite Scouts and their families to join them for weekends on the snow and ski slopes at exclusive discounted rates. Special Pricings for Lift Ticket, Ski or Snowboard Rental Package, Learn to Ski or Snowboard and Groups 15+. Login with the Spirit of Adventure code to receive discounts, included in this flyer. New England’s largest entertainment concierge – The Best Seats VIP offers customized entertainment experiences. Their VIP Hosts will work with you on any organizational outing for the scouts to take advantage of and provide unique, once-a-lifetime experiences. All members within Spirit of Adventure can receive 10% off on all orders by using promo code SCOUT10 at checkout. For more information, contact Brandon Gilson at 781 201 0347, email: Brandon@TheBestSeatsVIP.com or visit their website. Please mention your Scout affiliation when you contact them. This offer has no expiration date. Dads of Boy Scouts in the Spirit of Adventure Council can now get their first month free of WonderDads with this special URL for Scouts in our Council. WonderDads is the largest membership-based association of Dads with kids ages 0-16, with over 50,000 members nationwide. Members get access to WonderDads This Weekend digital magazine, critically-acclaimed Dad resources, and their own online account where they can do everything from create an interactive Dad-Kids bucket list to plan a Dad-Kids trip. WonderDads entire mission is to help members be even better and “funner” Dads, and help them make the most of their kid’s childhood years. Check it out and get your first month free!